In Christian theology, baptism with the Holy Spirit (also called baptism in the Holy Spirit or Spirit baptism) is distinguished from baptism with water. It is frequently associated with incorporation into the Christian Church, the bestowal of spiritual gifts, and empowerment for Christian ministry. While the exact phrase "baptism with the Holy Spirit" is not found in the New Testament, two forms of the phrase are found in the canonical gospels using the verb "baptize", from the Greek word baptizein meaning to "immerse" or "plunge". The baptism was spoken about by John the Baptist, who contrasted his water baptism for the forgiveness of sins with the baptism of Jesus. In Mark and John, the Baptist proclaimed that Jesus "will baptize in (the) Holy Spirit"; while in Matthew and Luke, he "will baptize with Holy Spirit and fire". El Greco's depiction of Pentecost, with tongues of fire and a dove representing the Holy Spirit's descent. The phrase "baptized in the Holy Spirit" occurs two times in Acts, first in Acts 1:4-5 and second in Acts 11:16. Other terminology is used in Acts to indicate Spirit baptism, such as "filled". "Baptized in the Spirit" indicates an outward immersion into the reality of the Holy Spirit, while "filled with the Spirit" suggests an internal diffusion. Both terms speak to the totality of receiving the Spirit. The baptism with the Holy Spirit is described in various places as the Spirit "poured out upon", "falling upon", "coming upon" people. To "pour out" suggests abundance and reflects John 3:34, "God gives the Spirit without limit". Another expression, "come upon" is related to a statement by Jesus in Luke 24:49, "I am sending the promise of my Father upon you. But stay in the city until you are clothed with power from on high". The language of "come on" and "clothed with" suggest possession by and endowment with the Holy Spirit. In the New Testament, the messianic expectations found in early Judaism were fulfilled on the day of Pentecost as recorded in Acts. The Christian community was gathered together in Jerusalem when a sound from heaven like rushing wind was heard and tongues like tongues of flame rested on everyone. They were filled with the Holy Spirit and began to speak in tongues, miraculously praising God in foreign languages. A crowd gathered and was addressed by the Apostle Peter who stated that the occurrence was the fulfillment of Joel’s prophecy, "And in the last days it shall be, God declares, that I will pour out my Spirit on all flesh, and your sons and your daughters shall prophesy". He then explained how the Spirit came to be poured out, recounting Jesus’ ministry and passion and then proclaiming his resurrection and enthronement at the right hand of God. In response, the crowd asked Peter what they should do. He responded that they should repent and be baptized for the forgiveness of sins in order to receive the gift of the Holy Spirit. Peter finished his speech stating that the promise "is for you and for your children and for all who are far off, everyone whom the Lord our God calls to himself". Baptism in the Holy Spirit occurs elsewhere in Acts. The gospel had been proclaimed in Samaria and the apostles Peter and John were sent from Jerusalem. The new believers had been water baptized, but the Holy Spirit had not yet fallen on them. The Samaritans received the Holy Spirit when Peter and John laid their hands on them. The Apostle Paul was also filled with the Holy Spirit when Ananias of Damascus laid hands on him, and afterwards Paul was baptized with water. Many Puritans believed that the experience of becoming a Christian was followed by a later and distinct experience of the Holy Spirit. This experience was characterized by receiving assurance of one's salvation. English Puritan Thomas Goodwin equated this experience with the baptism in the Holy Spirit and the "seal of the Spirit" referenced in the Epistle to the Ephesians. Lastly: if we will attain the full power of godliness, and be peaceable as the Prince of Peace, and merciful as our heavenly Father, let us go on to the perfection and glory of Christianity; let us enter the full dispensation of the Spirit. Till we live in the pentecostal glory of the Church: till we are baptized with the Holy Ghost: till the Spirit of burning and the fire of Divine love have melted us down, and we have been truly cast into the softest mould of the Gospel: till we can say with St. Paul, "We have received the Spirit of love, of power, and of a sound mind;" till then we shall be carnal rather than spiritual believers. In mid-19th century America, the Wesleyan holiness movement began to teach that entire sanctification was less a process and more of a state that one entered into by faith at a definite moment in time. This second blessing, as it was commonly called, allowed Christians to be freed from the power of sin. Among adherence of the holiness movement, baptism in the Holy Spirit was synonymous with second blessing sanctification. 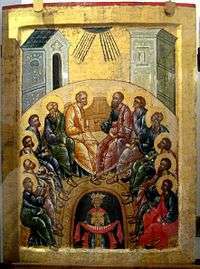 Russian Orthodox depiction of Pentecost, c. 1497. This holy ointment is no more simple ointment, nor (so to say) common, after the invocation, but the gift of Christ; and by the presence of His Godhead, it causes in us the Holy Ghost. It is symbolically applied to thy forehead and thy other senses and while thy body is anointed with visible ointment, thy soul is sanctified by the Holy and life-giving Spirit. The Catholic Church teaches that baptism, confirmation, and the Eucharist—the sacraments of Christian initiation—lay the foundations of the Christian life. The Christian life is based on baptism. It is "the gateway to life in the Spirit" and "signifies and actually brings about the birth of water and the Spirit". The post-baptismal anointing (Chrismation in the Eastern churches) signifies the gift of the Holy Spirit and announces a second anointing to be conferred later in confirmation that completes the baptismal anointing. The main position on Spirit baptism among the Reformed churches, dispensationalists, and many Baptists is that the baptism with the Holy Spirit occurs simultaneously with regeneration, when those who have faith in Jesus Christ receive the Holy Spirit and are incorporated into the body of Christ. In classical Pentecostalism, the baptism with the Holy Spirit is understood to be a separate and distinct experience occurring sometime after regeneration. It is an empowering experience, equipping Spirit-filled believers for witness and ministry. Extending from this is the belief that all the spiritual gifts mentioned in the New Testament are to be sought and exercised to build up the church. Pentecostals believe that Spirit baptism will be accompanied by the physical evidence of speaking in tongues (glossolalia). I was overcome by the mighty fulness of power and went down under it. For three hours He wrought wonderfully in me. My body was worked in sections, a section at a time. And even the skin on my face was jerked and shaken, and finally I felt my lower jaw begin to quiver in a strange way. This continued for some little time, when finally my throat began to enlarge and I felt my vocal organs being, as it were, drawn into a different shape. O how strange and wonderful it was! and how blessed it was to be thus in the hands of God. And last of all I felt my tongue begin to move and my lips to produce strange sounds which did not originate in my mind. 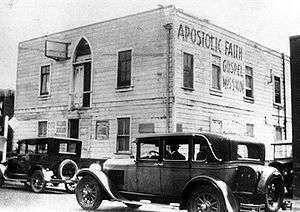 The Apostolic Faith Mission on Azusa Street, now considered to be the birthplace of Pentecostalism. While seeking for the Baptism with the Holy Ghost in Los Angeles, after Sister Ferrell [sic] laid hands on me I praised and praised God and saw my Savior in the heavens. And as I praised, I came closer and closer and I was so small. By and by I swept into the wound in His side, and He was not only in me but I in Him, and there I found that rest that passeth all understanding, and He said to me, you are in the bosom of the Father. He said I was clothed upon and in the secret place of the Most High. But I said, Father, I want the gift of the Holy Ghost, and the heavens opened and I was overshadowed, and such power came upon me and went through me. He said, Praise Me, and when I did, angels came and ministered unto me. I was passive in His hands working on my vocal cords, and I realized they were loosing me. I began to praise Him in an unknown language. Charismatics trace their historical origins to the charismatic movement of the 1960s and 1970s. They are distinguished from Pentecostals because they tend to allow for differing viewpoints on whether Spirit baptism is subsequent to conversion and whether tongues is always a sign of receiving the baptism. In the Latter Day Saint movement, the "Baptism of fire and of the Holy Ghost" refers to the experience of one who undergoes the ordinance of confirmation with the laying on of hands to receive the gift of the Holy Ghost. It follows baptism in water and is essential to salvation. The gift of the Holy Ghost is the privilege of receiving inspiration, divine manifestations, direction, spiritual gifts, and other blessings from the Holy Spirit. It begins the lifetime process of sanctification. Matthew 3:11: …He will baptize you with the Holy Spirit…"
Mark 1:8: …He will baptize you with the Holy Spirit…"
Luke 3:16: "He will baptize you with the Holy Spirit…"
Luke 24:49: …stay here in the city until you have been clothed with power from on high." (see fulfillment in Acts 2). John 1:33: …the one who baptizes with the Holy Spirit." Acts 1:4-5: …the Promise of the Father…"; …you will be baptized with the Holy Spirit…"
Acts 2:1-4: "All of them were filled with the Holy Spirit and began to speak in other languages…"
Acts 2:14-18: …I will pour out my Spirit…" (quoting Joel 2:28-29). Acts 4:31: …they were all filled with the Holy Spirit…"
Acts 8:14-17: …prayed for them that they might receive the Holy Spirit…"; …as yet the Spirit had not yet come upon any of them…"; …they received the Holy Spirit…"; …the Spirit was given through the laying on of the apostles' hands…." Acts 9:17: …Jesus…has sent me…that you may…be filled with the Holy Spirit." Acts 10:44-48: "The Holy Spirit fell upon all who heard the word…"; …the gift of the Holy Spirit had been poured out…"; …people who have received the Holy Spirit…"
Acts 11:15-16: …the Holy Spirit fell upon them…"; …you will be baptized with the Holy Spirit…"
Acts 19:1-6: "Did you receive the Holy Spirit…? "; …the Holy Spirit came upon them, and they spoke in tongues and prophesied…"
1 Cor 12:13: "For in one Spirit we were all baptized into one body--Jews or Greeks, slaves or free..."
1 2 3 4 Grudem 1994, pp. 763-4. ↑ Grudem 1994, p. 770. 1 2 Carson & Cerrito 2003, pp. 100-03. ↑ Greenspahn 1989, p. 37. ↑ Wurzburger 2007, p. 580. ↑ "Holy Spirit", Jewish Encyclopedia (1906). Accessed March 15, 2012. ↑ Catechism of the Catholic Church, paragraph 1214. ↑ McDonnell & Montague 1991, p. 4. ↑ McDonnell & Montague 1991, p. 7. 1 2 Grudem 1994, p. 771. 1 2 "Baptism in the Holy Spirit", New International Dictionary of Pentecostal and Charismatic Movements. 1 2 Duffield & Van Cleave 2008, p. 312. ↑ Catechism of the Catholic Church, paragraphs 1288-1292. ↑ Synan 1997, p. x. ↑ Bromiley 1978, p. 278. 1 2 Dunn 1977, p. 1. 1 2 3 4 Wacker 2001, p. 2. ↑ Synan 1997, pp. 6-7. ↑ Fletcher 1833, p. 356. ↑ Synan 1997, pp. 14-5. ↑ Synan 1997, p. 50. ↑ Synan 1997, p. 89. ↑ Macchia 2006, p. 64. ↑ Cyril 1986, p. 65. ↑ Catechism of the Catholic Church, paragraph 1212. ↑ Catechism of the Catholic Church, paragraphs 1213, 1215. ↑ Catechism of the Catholic Church, paragraphs 1241-1242. ↑ Catechism of the Catholic Church, paragraph 1285. ↑ Catechism of the Catholic Church, paragraph 1302. ↑ Catechism of the Catholic Church, paragraph 1303. ↑ Carson & Cerrito 2003, pp. 84-92. ↑ Kaiser 2004, p. 36. ↑ Pettegrew 1997, pp. 29-46. ↑ Allison 2012, p. 5. ↑ Vanhetloo 1989, p. 103. ↑ Buschart 2009, p. 194. 1 2 Articles of Faith of the Church of the Nararene, Article X. Accessed May 21, 2011. ↑ "Introduction", New International Dictionary of Pentecostal and Charismatic Movements. ↑ Grudem 1994, pp. 764-5. ↑ Jacobsen 2003, p. 20. ↑ Robeck 2006, p. 182. ↑ New International Dictionary of Pentecostal and Charismatic Movements 2001, p. 465. ISBN 0-310-22481-0. ↑ Ludlow 1992, pp. 97-8. ↑ Ludlow 1992, pp. 543-4. ↑ Ludlow 1992, pp. 310-11. Allison, Gregg R. (2012), "Baptism with and Filling of the Holy Spirit" (PDF), Southern Baptist Journal of Theology, 16 (4): 4–21 . Arrington, French L. (Fall 1981), "The Indwelling, Baptism, and Infilling with the Holy Spirit: A Differentiation of Terms", Pneuma: The Journal of the Society for Pentecostal Studies, 3 (1) . Burgess, Stanley M.; Van der Maas, Eduard M., eds. (2001). New International Dictionary of Pentecostal and Charismatic Movements. Zondervan. ISBN 0-310-22481-0. Greenspahn, Frederick E. (Spring 1989), "Why Prophecy Ceased", Journal of Biblical Literature, 108 (1) . Pettegrew, Larry D. (Spring 1997), "Dispensationalists and Spirit Baptism" (PDF), Masters Seminary Journal, 8 (1): 29–46 . Robeck, Cecil M., Jr. (2006), The Azusa Street Mission and Revival: The Birth of the Global Pentecostal Movement, Nashville, Tennessee: Thomas Nelson, Inc.
Vanhetloo, Warren (Spring 1989), "Spirit Baptism" (PDF), Calvary Baptist Theological Journal: 90–116 . Wurzburger, Walter S. (2007). "Prophets and Prophecy". In Berenbaum, Michael; Skolnik, Fred. Encyclopaedia Judaica. 16. Detroit: Macmillan Reference USA. pp. 566–86. ISBN 978-0-02-865928-2. Hayford, Jack W. Baptism with the Holy Spirit. Chosen, May 1, 2004. ISBN 978-0-8007-9348-7. Written from a Pentecostal perspective. Montague, George T. Holy Spirit, Make Your Home in Me: Biblical Meditations on Receiving the Gift of the Spirit. Word Among Us Press, February 2008. ISBN 978-1-59325-128-4. Written from a Catholic charismatic perspective. Phillips, Ron. An Essential Guide to Baptism in the Holy Spirit: Foundations on the Holy Spirit Book 1. Charisma House, June 7, 2011. ISBN 978-1-61638-239-1. Written by a charismatic Southern Baptist pastor. Torrey, R.A. The Baptism With The Holy Spirit. Kessinger Publishing, LLC, September 10, 2010 (originally published in 1895). ISBN 978-1-168-92945-7. While evangelical pastor R.A. Torrey distanced himself from the Pentecostal movement, he did believe the baptism with the Holy Spirit was a second work of grace. Yun, Koo Dong. Baptism in the Holy Spirit: An Ecumenical Theology of Spirit Baptism. University Press of America, 2003. ISBN 978-0-7618-2636-1. The author analyzes nine different theologians' views on Spirit baptism from various Christian traditions (Roman Catholic, Lutheran, Dispensational, Pentecostal, and Reformed).